I have a strong tendency to over-think most decisions, so when Carrie asked me what I'd like to review for the book club, my initial reaction was to tell her I would think about it. Which is code for "I will agonize over a list of titles, and after I choose one, I will still wonder if it was the best choice." But while I was typing an email to tell Carrie I'd think about it, I realized it was silly to drag out such a decision. 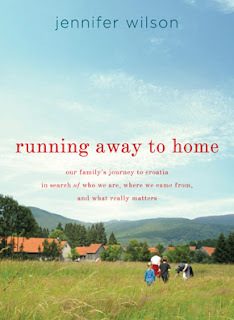 So I went to the list of books I wanted to read, and picked the first one: Running Away to Home , by Jennifer Wilson. Wilson is a fellow Iowan who decides to move to her ancestral homeland of Croatia for a year in hopes of reconnecting with her past and present family. The bottom line is that while I enjoyed certain aspects of the book, it won't become a favorite. If you want to learn more, read on. Since I am listmaker by nature, my review is structured accordingly. *Though Iowa is my “adopted home state,” I feel an instant kinship with writers who have an Iowa connection, and I was interested in the mentions she made about The Hawkeye State. *The importance of family is certainly emphasized. The catalyst for moving to Croatia was two-fold: 1) Wilson and her husband desired to break away from their fast-paced suburban lifestyle and reconnect with each other and their two young kids, and 2) Wilson felt a strong pull to learn more about her ancestors and the land from which they came. *That leads me to my next point, which is that I liked the emphasis on the importance of building relationships with others. Having been a college dorm director for a season of my life, this was ingrained in me—the value of being intentional in spending time with others and getting to know them. Wilson had to work harder at this than her husband did, but she still understood the importance of opening up to others and allowing them to do the same. *The use of language and alcohol is quite prevalent. Of course much of it is cultural since it is a travel memoir, but the author certainly participates and even relishes her participation. (I was unaware of this when I chose the book, and want that to be clear.) I am not against alcohol in and of itself, but the book hardly encourages moderation, and drinking in excess was mentioned so often that it left a bad taste in my mouth. Same with the use of coarse language. *I was somewhat troubled by Wilson’s perspective on work and motherhood. I’m not starting a debate about a career vs. staying home—that is not my point. The point is that I felt Wilson was saying throughout the book that motherhood itself is not a calling. *Lastly, though less strongly, I did not as much enjoy the sections of the book that discussed Croatian history. However, that is merely a personal preference, and I know that history gives context to the present state of affairs in any place. So there you have it—a list of what I liked and did not like about Running Away to Home . Despite the crude aspects of the book, I think it was still a refreshing reminder that the world is a diverse and fascinating place. Sometimes it's easy to get caught up in my own environment, and I find it fun to be "an armchair traveler." If you read along this month, I’d love to hear your impressions. 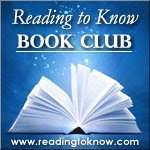 Thanks, Carrie, for the opportunity to review the book here! I've got about 70 pages to go - I wasn't able to get it until midway through the month. *Carrie* has a pretty good synopsis, which I will link from my blog when I post. BTW, thanks, *Carrie* for being bold and making a spontaneous and bold choice of a book I otherwise might never have heard of. I really ended up enjoying it for all the aforementioned reasons. I really am glad you gave me this title on a "forced" whim. ;D VERY interesting read and certainly NOT one I would have picked up all on my own. I like that you said it's hard for you to not overthink book suggestions. I feel your pain. Great and thoughtful review you have here! @Stephanie - FUN post! Loved looking at your pictures. That's so cool. @BerlinerinPoet - I like the point you make about the size of our front porches. And I can't imagine that you'll conclude the book and decide you didn't like it. ;D Thanks for reading along! @Diary of an A - Can't wait to hear your concluding thoughts. I enjoyed reading all these comments, and will click over and read the other reviews. Thanks again for the opportunity to participate! Ok, finally finished my review.